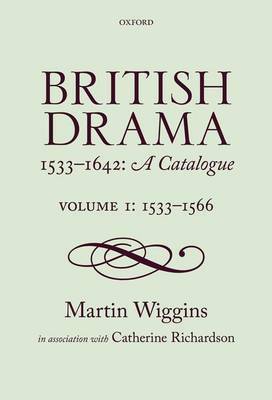 This is the first volume of a detailed play-by-play catalogue of drama written by English, Welsh, Irish, and Scottish authors during the 110 years between the English Reformation and the English Revolution, covering every known play, extant and lost, including some of which have never before been identified. It is based on a new, complete, and systematic survey of the whole of this body of work, presented in chronological order. Each entry contains comprehensive information about a single play: its various titles, authorship, and date; a summary of the plot, a list of roles, and details of the human and geographical world in which the fictional action takes place; a list of sources, narrative and verbal, and a summary of the formal characteristics; details of the staging requirements; and an account of the early stage and textual history.